Could this be the “Limitless” breakthrough we’ve been looking for? Researchers at Baylor College of Medicine (BCM) have discovered that when the activity of PKR — a molecule normally elevated during viral infections — is inhibited in the brain, mice learn and remember dramatically better. “The molecule PKR (the double-stranded RNA-activated protein kinase) was originally described as a sensor of viral infections, but its function in the brain was totally unknown,” said Dr. Mauro Costa-Mattioli, assistant professor of neuroscience at BCM. But the activity of PKR is altered in a variety of cognitive disorders, so Costa-Mattioli and colleagues decided to take a closer look. “We found that when we genetically inhibited PKR, we increased the excitability of brain cells and enhanced learning and memory in a variety of behavioral tests,” said Costa-Mattioli. For instance, they tested the mice ability to use visual cues for finding a hidden platform in a circular pool. Normal mice had to repeat the task multiple times over many days to remember the platform’s location. Mice lacking PKR learned the task after only one training session. The BCM researchers also found that this process could be mimicked by a PKR inhibitor — a small molecule that blocks PKR activity and thus acts as a “memory-enhancing drug.” The next step is to use what we have learned in mice and to try to improve brain function in people suffering from memory loss, said Costa-Mattioli. Unfortunately, there’s a secret government conspiracy to keep this drug out of your hands. OK, I made that part up. 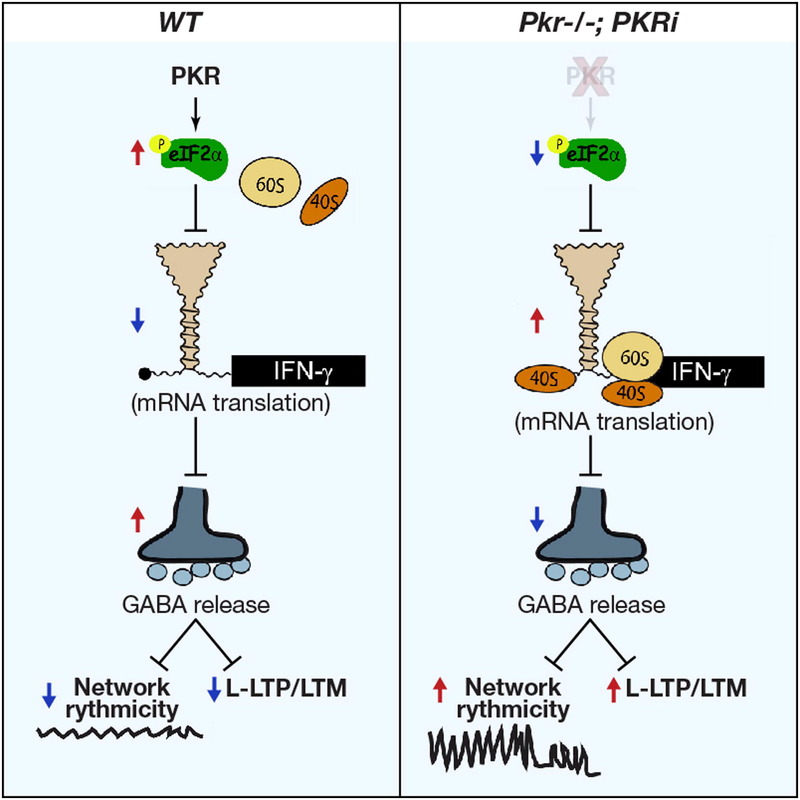 But note the figure above: in mice that have been genetically engineering to inhibit PKR (right), the result is to lower GABA release. We know that GABA, the brain’s major inhibitory neurotransmitter, has an anti-anxiety or calming effect, which is why tranquilizers increase GABA production. So could using the PKR inhibitor drug also lead to increased anxiety? Also, PKR is not just elevated during viral infections. PKR is thought to be a key player in cellular response to different kinds of stress: PKR activation leads to inhibited protein synthesis and transcription of genes involved in an inflammatory response. So you get smarter, but also get sicker if you have the flu or some other stressor? Or maybe just take it when you’re not under stress? I have an email into Dr. Costa-Mattioli find out more.